Formulated for repair facilities, yet safe enough for your jewelry. Non-harmful, non-acid. 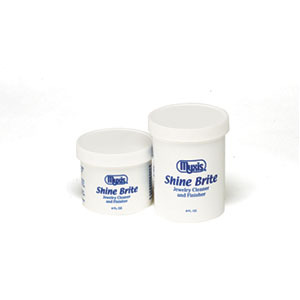 Shine Brite works remarkably well on most difficult to clean jewelry such as cubic zirconia rings, cz earrings, mesh and rope chains, diamond bracelets and cluster rings, precious metals, watch bands, essentially all jewelry and most stones. Shine Brite dissolves dirt and grime away faster than other cleaners without the use of an ultrasonic, and rinses away completely in warm or light steam. Sold in a 4 or 8 oz. jar.